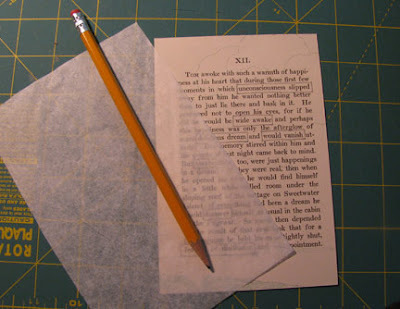 For my page in the Altered Book group anniversary book, I decided to do a found poem. I've got an old novel called My Lady of the Fog (Ralph H Barbour, 1908) and another Russian text called Selected Stories (Daniil Kharms, 1919). 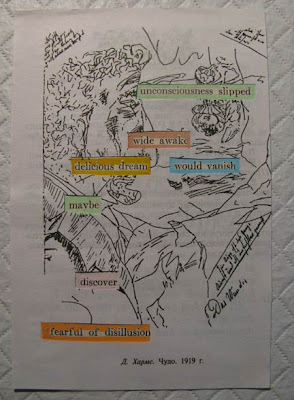 Very different from each other in feel, I decided to use one of the illustrations from Kharms's book and do a found poem using a page from Barbour's. Really, I couldn't do it the other way around: I can't read Russian! 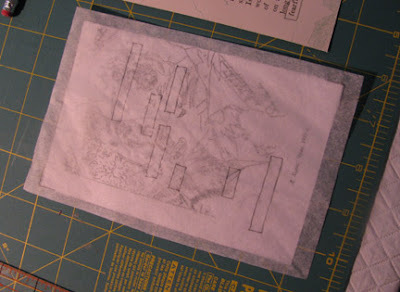 Here's the instructions that I wrote two years ago for using tissue paper as a guide when creating found poems. This project was done in a similar fashion as the steps below will show. 1. Collect your material, tools, and two book pages that you want to use for your found poem. 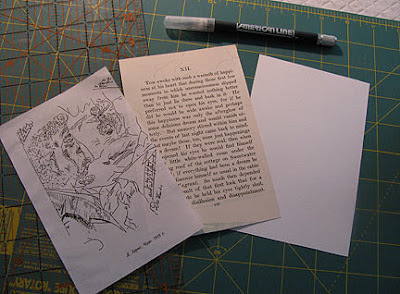 Cut the pages and a piece of card stock to the same size. 2. Find the words and phrases that you want to use in your poem and put a box around them with pencil. Place a piece of tissue paper over the page, and mark the corners. 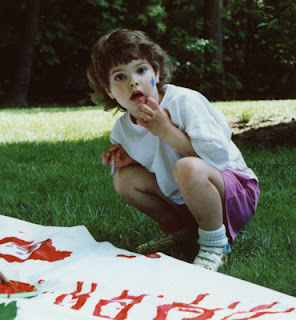 Trace each word box onto the tissue paper. 3. Place the tissue paper over the other page. This page can be an illustration, photo, or more text...whatever you choose. Make sure the corners are lined up properly, and cut through each box with an Exacto knife. Discard the tissue paper. 4. Stack the pages with the card stock on the bottom, the text in the middle, and the page with cut outs on top. Adhere them all together with a glue stick or other low-moisture adhesive. Decorate the top page as you choose. I outlined each phrase with colored markers, and I think I'll probably add some more embellishments before I declare this page finished. Great idea. I wonder if this would be a good way to find inspiration when my muse fails me. Just randomly pick out words from a page and play with them.